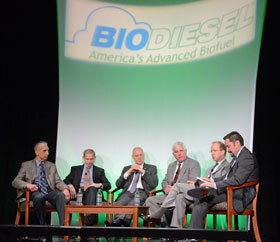 During the opening general session of the conference a panel discussion featured Charles Drevna, American Fuel & Petrochemical Manufacturers Association; Michael Ferrante, Massachusetts Oilheat Council; Dan Gilligan, Petroleum Marketers Association of America; Joe Jobe, NBB and John Maniscalco, New York Oil Heating Association. It was a session that one person tweeted, “Maybe the most candor I’ve ever seen in a general session conversation at a conference. Very interesting #nbb12” I fully concur. Here’s how our program described the session. brass among petroleum trade associations will discuss everything from the industry’s perception of biodiesel as a mainstream product to the future of Bioheat® and how energy policy will leave a lasting imprint on everyone in the energy industry. Remember that you can follow what the Twitterverse is saying about the conference using the hashtag #NBB12.